Sardar Pro Shruti Box 13 Reed Side Control 3C 4C. Monoj Kumar Sardar & Bros. brand shurti box. 13 reeds, 3C-4C, with 13 imitation ivory side mounted controls. Blemishes in the finish occur during the two month journey from the manufacture to the US. They are unavoidable and do not affect the sound or playability. The possible combinations or reeds of can produce hundreds of sounds. The male shruti has a deeper sound than the female. To play, open one or more reeds by pushing the toggle to the side, unlatch the integral bellows and unlatch the reeded side. It is essential that at least one reed be open when you pump the bellows. 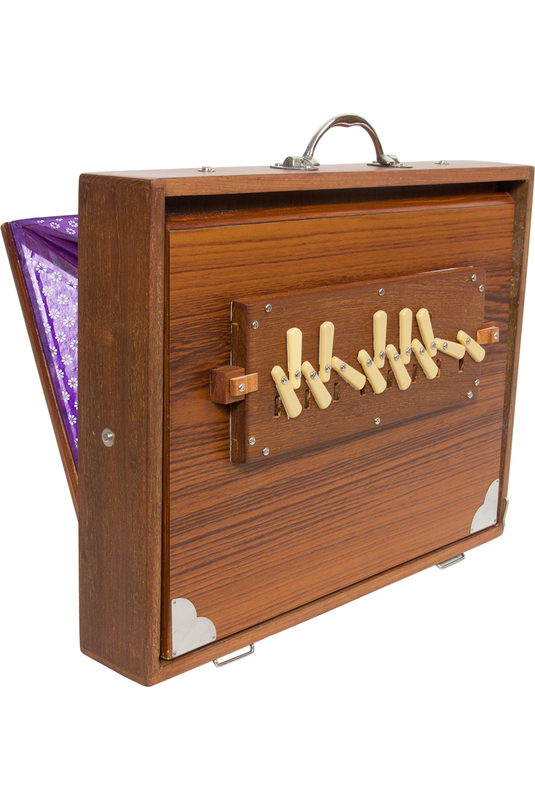 Each shruti box has a handle and metal feet for easy placement during play. It also comes with a soft zippered case for storage and transport. Color may vary from photo. Approximate measurements: 16" L x 12" W x 2.75" D.